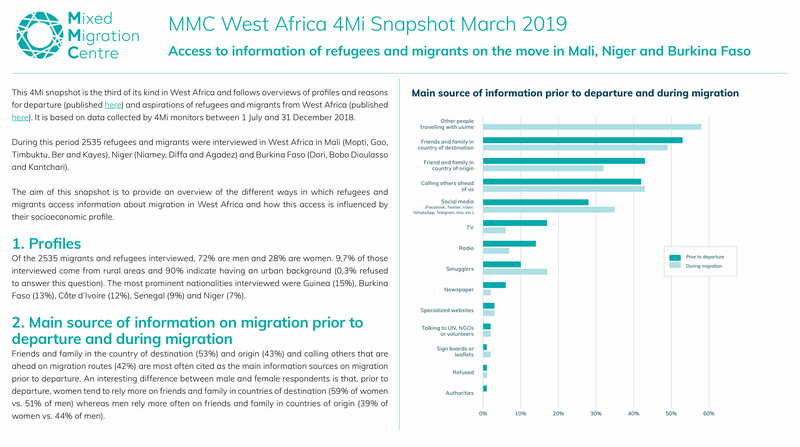 This 4Mi snapshot provides an overview of the different ways in which refugees and migrants access information about migration in West Africa and how this access is influenced by their socioeconomic profile. This snapshot is based on data collected by 4Mi monitors between 1 July and 31 December 2018. During this period 2535 refugees and migrants were interviewed in West Africa in Mali (Mopti, Gao, Timbuktu, Ber and Kayes), Niger (Niamey, Diffa and Agadez) and Burkina Faso (Dori, Bobo Dioulasso and Kantchari).